Trump Inauguration Pizzas. (Not my best work 或者 my best photos, but) I decorated these pieces of Ellio's 比萨, 比萨饼 in the afternoon of January 20, 2017, after Donald J. Trump was sworn in as president. 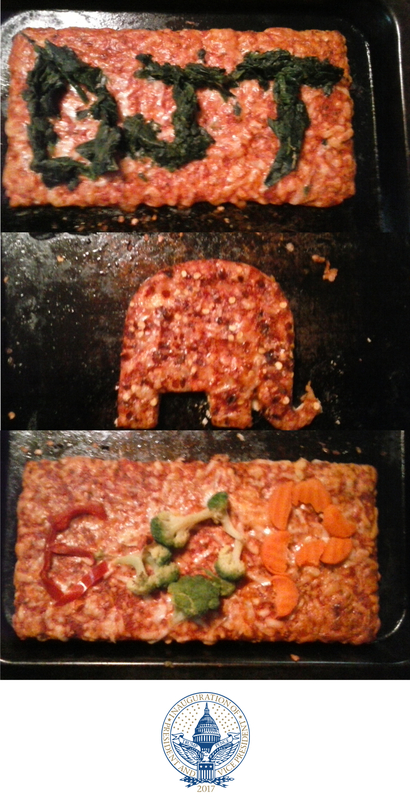 See 评论 for 更多 about the decorating.. HD Wallpaper and background images in the U.S. Republican Party club tagged: photo inauguration day donald trump trump inauguration pizza republican gop djt republican elephant. The decorating includes one piece with spinach spelling out the president's initials, DJT; one piece with crushed red pepper, which I cut a Republican elephant–shaped piece from with a cookie cutter; and one piece with a "G" made with red peppers, an "O" made with broccoli, and a "P" made with carrots—the GOP stands for "Grand Old Party," a nickname of the Republican Party. Yum!